Husqvarna, a division of the world’s largest producer of outdoor power products and lawn care equipment, today announced the company’s next generation of 50cc chainsaws for professional loggers and arborists, the Husqvarna 550 XP Mark II and the 545 Mark II. The chainsaws are redesigned from scratch, resulting in a new level of cutting capacity, maneuverability and endurance, making them optimized for harvest forestry and urban forestry applications including felling, limbing, removals or cross cutting of small and mid-sized trees. Coming 60 years after the launch of its very first saw, Husqvarna this year introduces two new 50cc chainsaws with a ground-up new design and engineering. The Husqvarna 550 XP Mark II and Husqvarna 545 Mark II have been developed to deliver outstanding cutting capacity for handling small and mid-sized trees. Cutting capacity is the true measure of the performance of the saw. It is the speed at which the entire system of the bar, chain and powerhead works together to cut wood at optimal RPM. Through a series of internal tests*, Husqvarna has shown that the 550 XP Mark II provides best-in-class cutting capacity when comparing to the closest competitor in the 50cc segment. “It’s not just a new chainsaw, it’s a new generation of chainsaws in which all vital parts are new. The Husqvarna 550 XP Mark II has superior cutting capacity and has been proven through the most extreme testing to assure it meets expectations of our most demanding forestry and tree care professionals. We are redefining the 50cc segment by setting a new standard for performance, durability and maneuverability,” explained Gent Simmons, director of product management, forestry at Husqvarna. 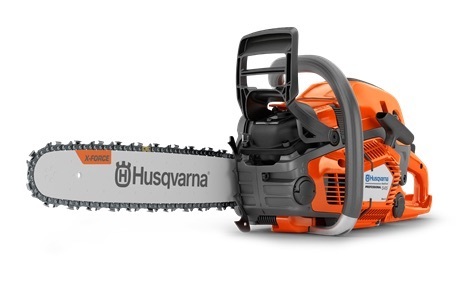 For the purpose of endurance in tough conditions, the cooling capacity of the Husqvarna 550 XP Mark II and Husqvarna 545 Mark II has been improved by 13 per cent, compared to the previous generation of 50cc chainsaws from Husqvarna. This is made possible by three key improvements: 1) an optimized airflow, 2) the addition of more cooling fins in critical areas that contribute to more effective cylinder heat dissipation, 3) an insulating heat shield, specifically developed for the new chainsaws, which provide sealing against the cylinder area and minimizes heat leakage. This helps keep the carburetor compartment cool to improve startability in hot conditions. In addition, a completely new muffler keeps temperatures down. For further endurance, the 50cc chainsaws have a new air filter design. The new design comes from the combination of a redesigned air filter with higher capacity and improved sealing and an upgrade of the Air Injection. This, in turn means the saws are equipped with a new optimized version of AutoTune, Husqvarna’s ignition module software and carburetor calibration. True to Husqvarna chainsaw heritage, the new generation of 50cc saws have a user-centric design. The well-balanced saw body with low gyroscopic forces provides excellent maneuverability and handling, enabling users to work longer without tiring. The ergonomically designed handles provide a safe, comfortable grip. In addition, the Husqvarna 550 XP G Mark II and the Husqvarna 545G Mark II are equipped with heated handles, for more comfort during cold weather use. Designed with the expert user in mind, the new 50cc chainsaws have two felling sights, one vertical and one horizontal – both are molded into the plastic for clear aiming and permanent guidance. The chainsaws are manufactured in Huskvarna, Sweden, and equipped with the X-CUT chain and the X-force bar. Both 50cc chainsaws will be available in stores from March 11, 2019. The MSRP will start at $724.99 for the 545 Mark II and $779.99 for the 550 XP Mark II. **Tests performed by Husqvarna during 2018, in a controlled environment, of an out-of-box Husqvarna 550 XP Mark II, compared to an out-of-box Stihl MS 261 C-M.